The crew of the UAS Helix traveled to the icy world Morgan saw when she looked into the Eye of Aether, known as Jötunheimr. After fighting the two icy automatons guarding a temple on the world’s surface, the crew awakened ancient man known as Adám and his Pokemon companion. Speaking with this man, the crew learned that he and his Pokemon were the fabled Adám and Eve of Sinai legend, the progenitors of all Humans and Pokemon, respectively. Adám, a man frozen in time since the time of the first cycle, shared insight into why the Mewtwos created the cycles and suggested that they give up their powers in order to take the first step toward showing that Humanity can be saved. Shane falls freely through the depths of warp space. Deeper and deeper he sinks, all the way back to the Void. The massive form of Giratina envelopes him as he arrives. The Pokemon gazes at him with a menacing, yet incredibly innocent and expectant look in its eyes. Shane reaches out with his marked hand and places it on Giratina. He focuses on the Pokemon and thinks of the way Adám had bonded with his own Pokemon. He tries to replicate that connection, and he feels Giratina’s presence touching his mind. Shane wills his power away and he can feel Giratina re-absorb it. Through the bond he now shares with Giratina, Shane asks it to take him back to the Helix, and he soon finds himself standing in the situation room, surrounded by his friends. He feels the connection with Giratina fade away, leaving behind pleasant feelings. “I took Adám’s advice,” Shane answers as he lifts up his marked arm. The swirling patterns of purple along his arm slowly turn to gold. They shatter into a brilliant glowing dust and drift away, leaving Shane’s skin as it once was, completely free of any scarring. A faint smile appears on Adám’s face, then he turns and walks out of the room. H glares angrily at the man’s back as he leaves, then he too departs. “But we can’t do anything without money,” Alex whines. “You never know until you try,” Naomi tells her as she begins to type away furiously on the holographically projected keyboard of her top-of-the-line Pokedex. Alex, however, doesn’t share her optimism. She climbs off the bed and starts heading for the door. “Hey, where are you going?” Naomi asks. “I… I just need to clear my head,” Alex tells her. Alex roams the halls of the Helix, contemplating the events of the past few days. It was all so much to take in and she had more questions than ever. It’s not long before she finds herself standing outside Shane’s old room, which the crew had provided to Adám. The truth of the man’s identity has finally sunk in. If anyone has the answers she seeks, it’s him. She touches the console and the door slides open. Adám sits cross-legged on the floor in the center of the room, meditating while his Pokemon companion floats around his head. Hearing the girl enter the room, the ancient man opens his eyes and looks up at her. “Uh… hi,” Alex says timidly. She stands there awkwardly for several moments, unsure where to begin. “Well, I… um… well, you… you’re real,” the girl manages to get out. “No, I mean I thought you were just a story,” Alex tells him. “Something the monks made up.” She sits down across from Adám in the same cross-legged position and begins rummaging through her bag. Adám looks on curiously as the girl pulls an old book from her bag and begins turning through its pages. Her menor, Raj, had given it to her when she was living in the Ninauli Monastery back on Vandia. It’s an old copy of the Sinai Bible from when the monastery still kept physical records, one of many the place had no more use for. Raj had told her that it was a version for children from a couple hundred years ago. Alex always liked it because it had pretty pictures. As Alex looks over to Adám’s Pokemon, the pink creature floats over to her. It gives her a curious glance with its adorable blue eyes. “You are right,” the ancient man tells her. “May I?” Alex asks, reaching her hand up. The girl’s heart warms as she strokes the top of the Pokemon’s head. The cute critter slowly rotates upside-down as Alex scratches its head, so the girl moves her hand down its back, just before it floats away, back to Adám. Adám reaches out and places a hand on the girl’s forehead. To Alex, it feels as if he is peering into her soul. Adám falls silent, leaving Alex to contemplate his words. “So, what happened to Cain anyway?” the girl finally asks. “Thank you, Adám.” Alex bows, then slips out of the room, leaving Adám to return to his meditations. Down in the warp lab, Shane busies himself working on a new project. Adám’s words had made Shane think long and hard about his abilities. He realized that it was quite possible that the use of his abilities, both those granted by Giratina and those resulting from him being a glitch in reality, damages the fabric of the Universe. While he has given up his influence over Space, he seeks to use the knowledge he gained while he had them to create a mechanical glove that allows him use the Warp. Pulling parts from warp drives he removed from the station, Shane attempts to create a prototype that functions in the most Universe-friendly way possible. His ultimate goal is for it to at least allow him to do the same things he is currently capable of as a reality glitch, but using the Warp to avoid the risk of glitching the Universe further. “I wanted to ask you something,” the young woman replies. The two exit the warp lab and take the elevator up to the upper deck. As they walk toward the airlock, they run into Adám who appears to be headed in the same direction. He turns to look at Shane and Morgan. The Eye of Aether towers above as the trio enters its chamber. They feel almost as if they are being watched. Shane and Morgan approach the spherical artifact while Adám hangs back and observes. Shane reaches out to the Eye and attempts to channel it with his newfound abilities. He can sense a presence within, but he can’t quite connect with it. “I’m sure I’ll figure something out,” Morgan replies. She takes a step toward the Eye and reaches out for it. “Are you sure you’ll be alright?” Shane asks, placing a hand on her shoulder. Morgan turns back to the Eye and places a hand on it, this time focusing on the being contained inside. She sees all of Time sprawling before her and once more feels the strong urge to get lost in it. However, this time, she resists and keeps herself focuses on the being within. With all her might, Morgan tries to will her powers away. She doesn’t want to have them. She needs to not have them. She feels a bit sad to lose her recently acquired gifts, but, at the same time, she fears what they did to her. More than anything else, she wants to reconcile with the Mewtwos and feels like she can’t do that with these powers, so she has resolved to give them up. Knowing that what Shane managed to do works, she tries and tries, but it’s difficult. Morgan is unsure if she is just not powerful enough to commune with the entity inside the Eye, or if the sphere is somehow interfering, but, whatever the reason, she is unable to relinquish control of her powers. She racks her brain for another solution, but nothing comes to mind. I just won’t use them, she decides. Morgan can feel the hunger for the knowledge of Time fade away as she resolves herself. She removes her hand and steps back from the Eye. “Did it work?” Shane asks. As Morgan departs, Shane walks up to the Eye and attempts to channel its aura once more. This time, he feels a connection form; he can sense a powerful presence very different from Giratina. It feels almost incomprehensible, alien to his mind. All Shane can feel is what he can only describe as a low rumbling. He realizes that he is simply interacting with the subconscious of a slumbering being, as if the outer shell that is the Eye separates out the emotions, directing the entity’s control of Time while keeping it subdued. While this knowledge is fascinating, Shane shoves it aside for the moment and focuses on what he came here for: research on the Warp from other cycles. Bits of code, and technology flash before him, and he is able to infer what he needs to do to power his prototype. Curious, Shane delves deeper into history’s collective knowledge on the Warp. He sees cycles where the Warp is studied entirely from a scientific perspective, others where the worship of the Warp is the cornerstone of Galactic society, and others much like this one where the Warp is viewed in a scientific and religious light. The thing that stands out to Shane the most is a schematic for some sort of warp bomb. Similar versions existed in other cycles, but the core implementation remained the same, and the resulting blast was… effective. 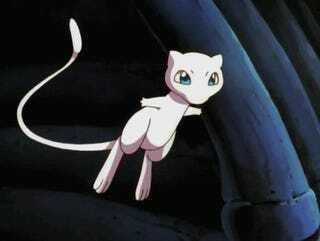 He latches onto it, realizing it may be the solution to fighting the Mewtwos they need. Satisfied, Shane severs the connection with the Eye. As he steps back from the sphere, he notices Adám approaching it. The ancient man reaches out and channels it in the same way that Shane had just moments before. Shane watches as a grim, almost disturbed expression appears on Adám’s face. Adám lowers his arm and stumbles back, away from the Eye. “What did you see?” Shane asks. In the brief time he had known the man, Shane got the sense that it took a lot to rattle him. “I saw how the wound in the Universe came to be,” Adám answers. “The wound in the Universe?” Shane asks, unsure of what he means. Adám turns and walks toward the exit, his Pokemon companion floating along behind him. He pauses as he reaches the door, and ponders for a long moment. “I think I may have found a way to fight the Mewtwos,” Shane announces to those gathered on the Helix’s bridge. “How, exactly, do you plan on doing that?” Morgan asks. “Sounds like a plan,” Rena tells him. “We will stay ‘ere and protect ze station. Good luck.” With that, the Parisian departs from the ship, leaving the crew to contact the Admiral. Once Graves hangs up, Shane turns to Minerva and nods. “Oh, you’re actually gonna let me do my job for once?” the pilot quips. Shane just points to his arm where the brand used to be and shrugs. “There you are,” Naomi’s voice speaks, pulling Alex out of her thoughts. “I’ve been looking all over for you. What are you doing hiding in here alone?” Alex looks up to see her love standing in front of her. “I just want to be alone for a while,” Alex answers, bowing her head. Naomi stands up and pulls Alex to her feet. “You are not a failure,” she says as wraps her arms around Alex and pulls her into a hug. “I don’t know what I’d do without you,” Alex responds. She hugs Naomi as tightly as she can. “Wow, I don’t know what to say,” Naomi responds, sounding quite surprised. She knows how attached to her Pokemon Alex can be, so she understands how big of a gesture she is making. “Really?” Alex asks, sounding a bit surprised. “I found something,” Naomi tells her. She pulls out her Pokedex, and activates the holographic display. “What is it?” Alex asks as she examines the image. Shane slaves away on the Warp bomb in one of the rear rooms of the Helix. He had managed to compact the bomb in the schematics so it would be easier to manufacture and use, especially for a prototype. In theory, everything would work. He leans against the wall and looks out into warp space. Shane had forgotten how long space travel took when he wasn’t just changing the ship’s relative position in space. He made a mental note to upgrade the Helix to be capable of free-warp, since they may have trouble getting through gates in the future. After all, I had done it, and it would be easy to replicate it using his research. In theory, everything would work. “God, this is never going to work,” Shane yells as he continues fiddling with the prototype. He knew exactly how it should work, but, in practice, actually building the damn thing was much harder than he had anticipated. Kiril would know what to do. Somewhat. After all, this is similar to the bomb they had found at the conference, is it not? If it was that hard to understand back then, how will I ever be able to complete it? Fortunately, warp travel takes a very long time. Alex hunches over her worktable working on a new Pokeball prototype. Everything she had learned over the past few days had drastically changed her understanding of the Universe, of herself, of her Pokemon. She now realizes that Pokeballs as they are now prevent her from being the person she wants to be, from having the bond that she seeks with her Pokemon. She now seeks to make a new kind of Pokeball, one that doesn’t exert any sort of controlling influence, one that allows the Pokemon contained within to leave at any time. It will serve only as a means of transporting Pokemon, and as a powerful tool in combat for a trainer such as herself. For hours, Alex slaves over her new design. She tears Pokeballs apart and puts them back together until she finally figures out how to make one function without the control elements. Now, for the moment of truth, the girl thinks as she stands up. She places her new creation on the table, then reaches for the Pokeball containing her Umbreon. Alex removes the custom casing she had placed on it, then she releases the Umbreon permanently. Alex grabs her new Pokeball off the table and crouches down in front of her Pokemon who looks up at her curiously. “Hey, Ebony,” she says as she strokes the Umbreon’s soft fur. Ebony happily rubs herself against the girl’s leg. “We’ve been together for as long as I can remember,” Alex tells her Pokemon. “But now we can truly be partners. We’ll show everyone how strong our bond is.” She holds out her new Pokeball. “This is your new home, Ebony. It won’t be like that old Pokeball.” The Umbreon places her paw on the button, and the balls pulls her in without a struggle. Alex immediately sends Ebony back out, then scoops her up into her arms. The Umbreon purrs softly as her trainer hugs her against herself. Exhausted from working on her new Pokeball, Alex climbs into bed with Ebony and snuggles up against Naomi, who had fallen asleep several hours before. Alex drifts off to sleep filled with happy thoughts. The Helix drops out of warp space in the Genesis Core System in Sector 1, the capital system of the Federation. Minerva flies the ship to the large, ringed gas giant Kaploy in the far reaches of the system, the seat of Federation military might. Countless bases, shipyards, and other installations are spread across the planet’s many moons. The space around Kaploy is surrounded by many dreadnoughts and the fleets they command. The heads of the Grand Navy of the Federation have gathered to plan against the threat of the Mewtwos. Once the man’s image vanishes from the screen, Minerva steers the ship toward Kaploy IX, the golden-brown gas giant’s largest moon. The pilot brings the Helix in, then docks with the docking tube as instructed as the crew prepares to depart. “Have fun,” Minerva says as they leave the bridge. As the crew makes their way to the airlock, Alex suddenly stops in her tracks. “Hold on a minute,” she tells her crewmates. “What is it, Alex?” Morgan asks, turning back to face the girl. After the crew disembarks from the Helix, a group of Federation marines escorts them to the council chamber. Eventually, they arrive at a door and are shown into a vast open room. A huge circular table with a hologram projector at its center sits in the middle of the room. Seated around this table are all the leading admirals of the Grand Navy of the Federation. Each has a small group of advisory officers standing behind them. Beyond the round table sits a large, raised platform where the Federation War Council is seated. There are two lower sections on either side, each with three admirals. In the raised center sits who Morgan recognizes as Grand Admiral David White, head of the entire navy. Underneath his elegant hat, his well-kempt white hair emerges and connects with a stylish and trimmed beard. A large scar slices across his left eye, covered over with a cyber-eyepatch. He takes a puff from his platinum, ruby-tipped, nuclear-powered cigar as he listens to the admirals at the round table speak. Alex’s eyes immediately light up when she recognizes the cigar from a movie she saw one time. As the crew moves further into the room, they see Admiral Graves seated at the round table on the side relatively close to the council bench. When the admiral spots them, she motions them over to her. A faint murmur spreads across the table as they approach. The Council examines the crew, judging them as murmurs erupt from the round table. By this point, news of the crew’s antics over the past few months had spread, now resulting in a wide range of reactions. Some seem intrigued and some suspicious. Others simply seem unimpressed, including one Douglas Haverson. Morgan clearly recognizes the admiral who had boarded the Dunsparce after the ship returned from Earth. She muses that the man must have gotten a promotion from rear admiral to even have a seat here. “These brave individuals have more experience with the Mewtwos than anyone here,” Graves concludes. She motions toward the crew and everyone in the room focuses their eyes on them. Shane projects a hologram from his glove into the center of the round table which details the specifications for the bomb and the fabricator in the middle of the table. As Shane explains the technical details, the admirals turn to their technicians, who are vigorously taking notes. The sound of murmuring slowly grows as the admirals at the round table discuss what to do with Shane’s prototype. It’s hard for the crew to make out what most people are saying, but they can catch a few words here and there. It sounds like no one is really agreeing on a solution. “We have a lot of old Bandolier class destroyers that are not currently in use,” Haverson speaks over the hushed tones, commanding the attention of his fellow admirals. “They can be retrofitted with these weapons without pulling our fleets away from the front.” Another wave of murmurs spreads across the room as the admirals assess the strengths and weaknesses of the ship and the tactical situation. “You imbeciles!” H suddenly blurts out. “You horribly incompetent fools! How could you? !” His lab coat swishes behind him as he turns and storms away. His crewmates look on with confused and surprised expressions as he exits the room. “What’s the meaning of this?” Graves barks at the remaining Helix crewmembers. As Graves sends for some men to detain H, a few of the advisors and some of the younger admirals fight to stifle laughter and are met with stern looks. The whole situation feels incredibly awkward. “The weapon specifications, as provided,” Shane says, motioning toward the hologram in the center of the table, attempting to get the discussion back on track. “I’m not sure how feasible this will be, but I think it would be poetic if this ended where it began.” Shane projects a hologram with a set of coordinates and a rotating image of Earth. Session Notes: Whew. This one took a long time to write. It was only like the last hour or so of the session and it was really all just RP, but for some reason it was just challenging to write. Maybe because there were a lot of added scenes and a lot of parts where there was just loose description. Let’s break it down, since this was another chapter I really liked. First we have the scene where Shane gives up his brand. This was hinted at in the previous chapter, but it actually happened. DragonStorm felt very proud of himself for making a player willingly give up a brand, but I think we felt like we had little choice, given the discussion from last chapter. However, Shane got to replace those powers with the Channeler class, which is one of the classes Adám has. So close to the end of the campaign, it didn’t make much difference but it was very cool from a narrative perspective I thought. The next scene was something I whipped up real quick to put a little bit of dialogue into a very brief description of Alex looking into fixing her Chandelure. I ended up splitting it and putting some at the end of a different scene once DragonStorm suggested the exchange between Alex and Adám. That was a scene that did not happen in game, but we added as a direct result of the big discussion in the comments of the previous chapter. We wanted to add a bit of mystery for the sake of the readers that we didn’t really get to experience as players. I actually really like how it turned out and it gave both Alex and Adám some really awesome character development. That fed into the next scene with the Eye. It was originally just Shane and Morgan, but we inserted Adám to build up that mystery. What did he see?! I don’t even know. As for the rest of that scene Morgan was trying to get rid of her powers, but Clarissa didn’t make the right rolls to figure it out. I actually don’t remember because the session was so long ago at this point and I finished the chapter well after I finished listening to the recording and outlining the chapter. Then there was Alex’s big scene. I had been planning it for a while, and once Adám happened the story fed really nicely into it. It was really just a blip in the session but I wanted to really make it matter. Alex actually gave up some of her Pokemon. That’s a really big thing for her. And then at the end is the leftovers from the previous Alex and Naomi scene. DragonStorm provided info on fire plates in fire temples, but given the point we were at in the campaign, there was no way to fit in going there. If it had happened earlier, I would’ve derailed the campaign to go there! Well, it’s just the next stop for Alex once she and her friends save the Galaxy! Then we have the war council. DragonStorm came up with this over the top Grand Admiral character that he just had to use. He put a stupid amount of thought into a cigar of all things. Lot’s of fun RP there. Pitching a plan, H doing something that we had no idea about, and an epic closing line that is actually a really dumb idea. Special thanks to The Other Guy and DragonStorm247 for assisting with the writing for this chapter! Also, a cameo shoutout to Kaploy9 for being a loyal reader/commenter since the beginning and to Unimplied for making the awesome gif for the Halloween special! Post-Chapter Challenge: Here’s a question for you, what did Cain do? What happened to him? 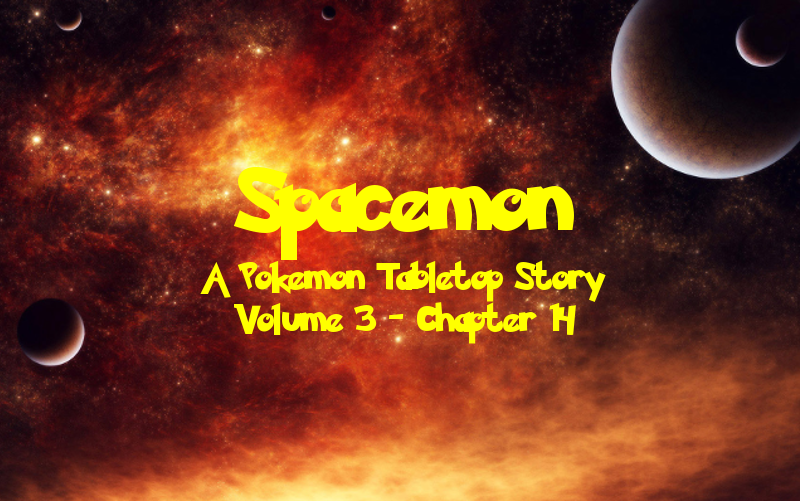 The only one who actually knows the answers is DragonStorm, and he’s keeping them under wraps for a future sequel campaign somewhere down the line (that’s right folks, you may get to read a new Spacemon adventure in the future!) so we can only guess. All we know for sure is that Cain damaged the Universe somehow and something happened to him such that “he no longer knows Life as we do.” What does it mean?! Readers, fellow players, let’s theorize here. Speculation go!